James Hetfield was born in 1963 in Downey, California in the United States. He was only nine years old when he first began taking piano lessons. After this he took on his brother David’s drums and when he was fourteen he started to play guitar. He co-founded Metallica in 1981 after he answered an advert that Lars Ulrich posted in a local Los Angeles newspaper and has always been part of the band. To date Metallica has won nine Grammy Awards and released nine studio albums, three live albums, four EPs and 24 singles. To date they have sold more than 53 million albums in the USA alone. The band has only had four former members: Ron McGovney, Dave Mustaine (who is Megadeth’s frontman), Cliff Burton (who died in a tourbus accident in Sweden in 1986) and Jason Newsted (who was the bassist for the band from 1986 to 2001). The other two current members of Metallica are Kirk Hammett and Robert Trujillo. Today is the 1st of Rocktober 2013. I will be trying my best to post something related to the bands that are being featured daily on Tuks FM. 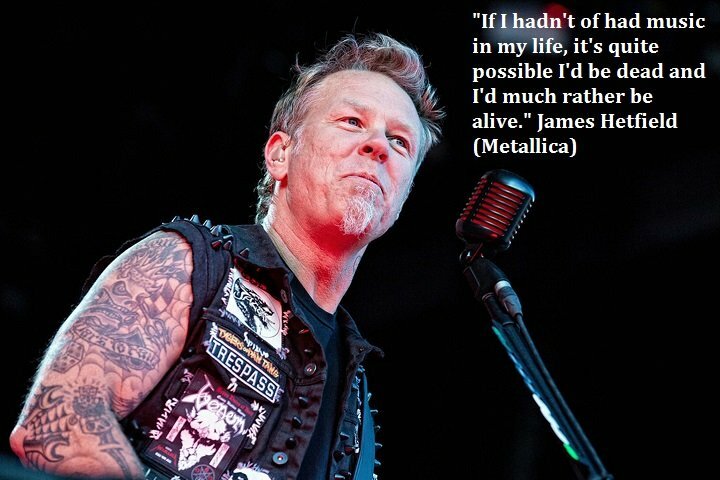 Today is Metallica day so it’s only fitting that I kick off this rocking month with an Epic James Hetfield Quote. Wise words from a legendary rocker, don’t you think? If you have some thoughts about this, feel free to comment on this post. Feedback is appreciated and welcome here. Pretty cool, don’t you think? If you’ve enjoyed this James Hetfield quote and the rock and metal trivia feel free to share this article with your friends on Facebook and Twitter. Remember: Sharing is Caring. Watch this space for regular updates in the Facts and Music categories on Running Wolf’s Rant. Hadn’t HAVE had, not, hadn’t “of” had… sheesh.